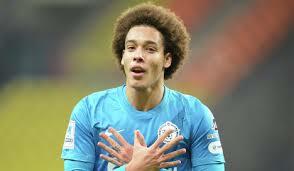 Chelsea are set to move for Zenit St Petersburg midfielder Axel Witsel as Jose Mourinho plans to bolster his squad ahead of next season. The Blues have identified Witsel as they look to improve their midfield options, with John Obi Mikel set to leave Stamford Bridge amid interest from Turkey and the Middle East. Witsel, 26, is eager to leave Zenit this summer and is a target for Serie A champions Juventus, but Chelsea believe he would prefer a transfer to west London. Mourinho is keen to ensure that Chelsea build on their Premier League title triumph this season and wants a side that can also challenge for the Champions League. Witsel would be considered a direct replacement for Mikel as a holding midfielder to challenge Nemanja Matic for a starting place. Mikel, 28, has been told he can leave Chelsea this summer and the Blues are hoping to offload him to a club in Turkey. Chelsea’s chances of landing Witsel will be boosted by the fact that the Belgian and Mourinho are represented by the same agent, Jorge Mendes. Witsel cost Zenit €40 million when he signed from Benfica in 2012 but he wants a new challenge after winning the Russian title last season under Andre Villas-Boas.